jbs inspiration: A Layout in Progress . . .
Hello! 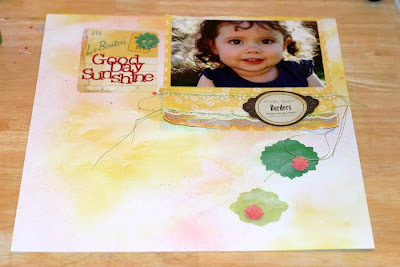 It's Doris here with a few "in progress" shots and my thoughts as I was creating "Good Day Sunshine" for the April Gallery. I started out with a recent photo of my baby niece that I love and a couple ideas that have been lurking around in my head since last month. I love the halo of sunshine behind my niece's wild head of curls in this shot and wanted to spotlight it. I have seen so many Polaroid images lately and really wanted to use that idea. 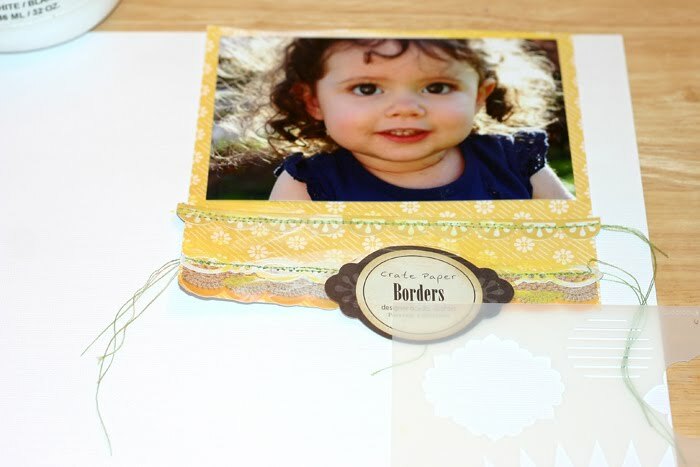 I originally thought to put the photo on the white cardstock to make an oversized Polaroid look then use the JBS Mercantile exclusive yellow patterned paper as the background. Ideas evolve though and I ended up making my Polaroid on the yellow paper and mounting it on the white cardstock. I think the yellow next to the picture really makes it shine. The other idea I've been holding onto was using the label sticker on the Crate Paper packaging. I can't help it, I'm a product packaging junkie! 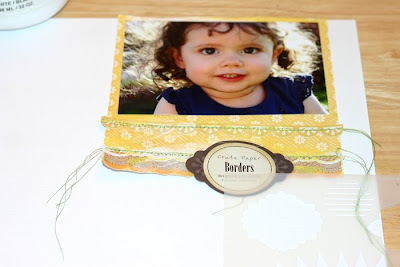 I then layered a couple border stickers, some gesso, and machine stitching over my "Polaroid." Next I wanted to figure out what to do with all that white cardstock. White cardstock tends to make me nervous . . . I decided to get artsy with my background. 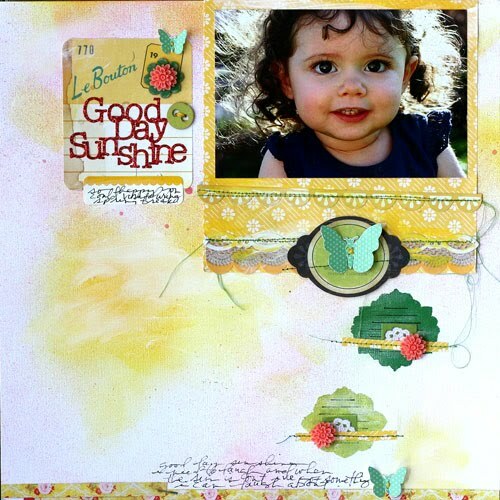 First I used the blending tool to add some Lemon Drops and Chewing Gum ink. I'm not very good with the blending tool yet, so I had some awkward spots. I finger painted over those with gesso and then misted here and there with Studio Calico Piglet. I had decided to add a couple more label shapes with the mask from the Good Day Sunshine Add-on. I hadn't really intended to add green to the layout, but the thread in my sewing machine was green and I was too lazy to change it, so there you go. . . . adding green. I used Seed Packet and Stick Candy Dabbers on the mask then blended the designs with a little more gesso. I was singing the title song in my head while creating the layout. How can you not think "Good Day Sunshine" when looking at that sweet face? One of the label stickers made a nice title block. 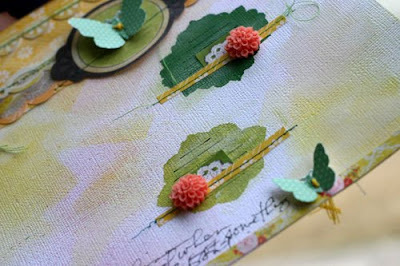 I then added the pink flowers and green button (seed packet again) to balance my colors. I'm also a visual triangle junkie. On to the details . . . I love the details. I put the butterflies on white cardstock, trimmed them out, folded up the wings, and cross-stitched them to the page. Beautiful! and totally worth the extra effort. I also added a yellow border strip to the bottom and some snippets of yellow to the label masks to balance the top heavy design. 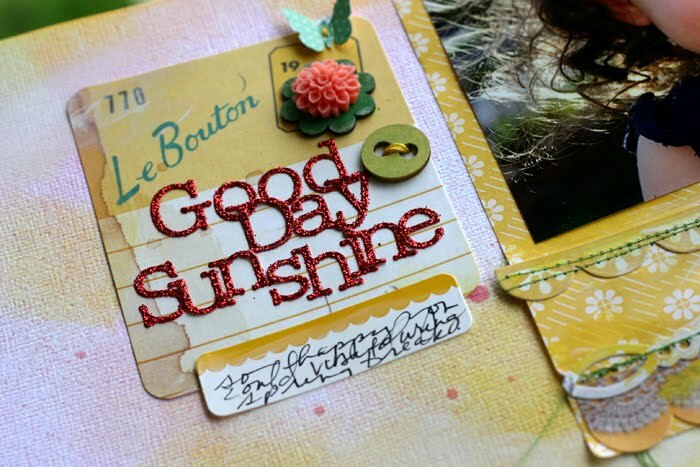 Good Day Sunshine indeed! What do you think? Do you like these in process posts? Are they helpful? Would you like to see more of them? Let us know! Yes, I would love to see more process posts! DEFINITELY love process posts!!! It is so helpful to see other's processes and I try to learn my own! Thank you! This is really pretty!